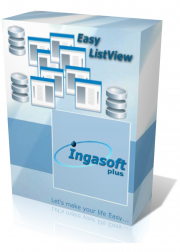 EasyListView is a Clarion wrapper around a .NET ListView. It makes the ListView easy to use in your Clarion applications and provides some neat extra functionality. Automatically transforms data source (ver 1 supports SQL connections and XML files) into a fully functional ListView, including automatically sorting and grouping rows. Supports owner drawing, including rendering animated graphics and images stored in a database. Easily edit the cell values. Easily enable drag and drop. Supports 5 ListView views (SmallIcon, LargeIcon, List, Tile, Detail). Supports collapsible groups (Vista only). Columns can be fixed-width, have a minimum and/or maximum width, or be space-filling (Column Widths). Displays a “list is empty” message when the list is empty (obviously). Supports tooltips for cells and for headers. Supports checkboxes in any column as well as tri-state checkboxes. Supports alternate rows background colors. Supports custom formatting of rows. Supports searching (by typing) on any column. Supports image and text overlays. All these are template driven! And it doesn't required any other components, 3rd party library, ActiveX/OCX etc! You'll get libraries, templates, examples and complete documentation.